Meandering beside the mighty Mississippi in Minnesota | A balanced diet . . .
We have been visiting Minnesota regularly for almost two decades, with the Twin Cities of Minneapolis and St Paul our main destination. One geographical feature dominates the landscape in the Twin Cities: the mighty Mississippi. It bisects the metropolitan area, with Minneapolis on the west bank, and St Paul on the east. Since a decade ago, our elder daughter Hannah and her husband Michael have lived just a few blocks from the Mississippi. In April this year they moved to a new house along the banks of the river – although at least 50 m above the water, so no danger of flooding there as the river flows through a limestone gorge. In this short video that I took on take-off from MSP last week, our Delta flight banked to the west, and followed the Mississippi northwest over the center of Minneapolis, and the rapids between the Central Ave SE bridge and that carrying I-35W. When we travel to the USA, Steph and I try to make a road trip, short or long. In 2011, it was the Grand Canyon and other canyons of Arizona and New Mexico. We were drawn to the Minnesota Riviera in 2012, and the Oregon coast, Crater Lake and the redwoods of northern California in 2013. 2014 saw us trek across the Great Plains from Minnesota to Yellowstone National Park, and last year we took a mini-break by train in Chicago. Because of the ongoing rehabilitation from my leg injury earlier this year, I didn’t want to make a long road journey. But we decided to take a mini-break, just 3½ days (and a round-trip of 750 miles) to the source and headwaters of the Mississippi River north of the Twin Cities in northwest Minnesota. 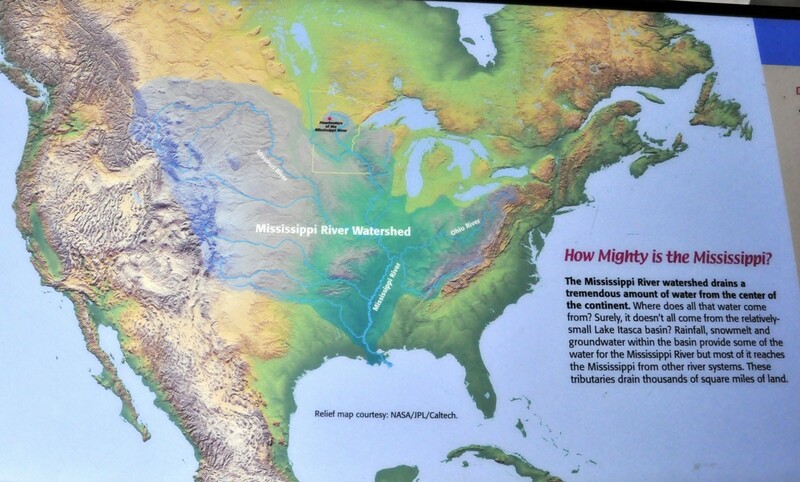 What is the source of the Mississippi? 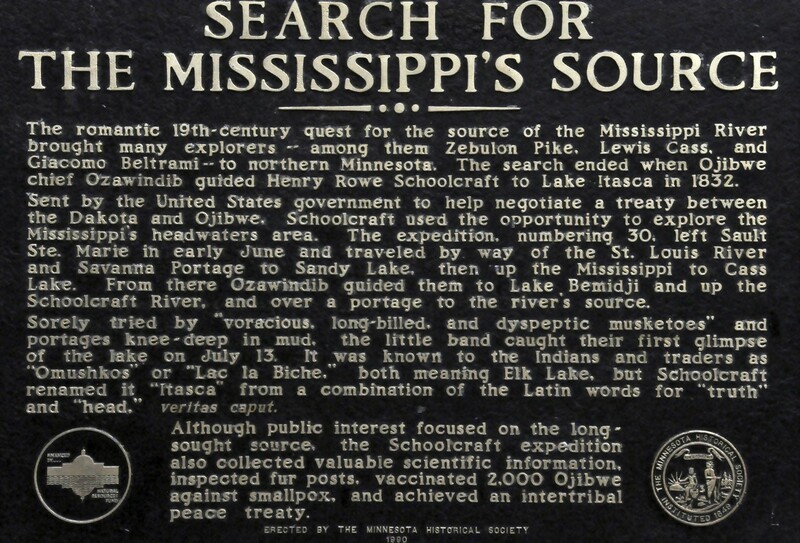 The source of the Mississippi was controversial for almost a hundred years in the 19th century, until, after a thorough hydrological survey by Jacob V Brower in 1888, Lake Itasca was confirmed as the source. Lake Itasca had been claimed as the source by Henry Rowe Schoolcraft in 1832. Our first day itinerary, of about 260 miles took us northwest to Nevis, where we had booked bed and breakfast accommodation at The Park Street Inn, a house built in 1912 by banker Justin Halvorson who came to the town to set up a bank and devlop this region of Minnesota. We spent almost the whole of our second day in Itasca State Park, touring the park by car, and stopping wherever the fancy took us. But our prime objective was the source of the Mississippi. Our destination on the third day was Grand Rapids, no more than about 75 miles by the most direct route from Nevis. We took almost 200 miles! On the last day, Thursday, and with the weather deteriorating (there had been flash floods in the Twin Cities overnight) we headed back to St Paul by the most direct route. We entered the park at the south gate, and stopped at the Jacob V Brower Visitor Center to pay our USD5 park fee, and see the various exhibits about the park, its establishment in 1891, and the history of exploration of the Mississippi headwaters. We took the road north along the lake to the source of the Mississippi as it leaves Lake Itasca, as a small stream bubbling over a small rapids, to begin its journey of more than 2000 miles to the Gulf of Mexico. I would have liked to cross the Mississippi on foot, but didn’t dare even make an attempt, although I made it across a log bridge just 50 feet or so down from the rapids. And Steph only made it to the middle of the stepping stones. The gap between two stones was just too wide for her to feel comfortable and, in any case, one broken leg in the family was more than enough! The Mississippi flows north out of the lake. Just a little further on, the park road crosses the river, no more than a stream ten feet wide, but with an auspicious sign alongside. We followed the Wilderness Road right round the park, stopping every so often to admire the scenery, views of the lake, the Fall colours in the trees, and the old-growth red and white pines (the remaining stands of these in the state). At the headwaters of the Mississippi there is an interesting set of displays about the river. This one caught my attention. It’s interesting to note that the Mississippi is not the longest or largest (in terms of flow) of the rivers that drain the overall watershed. The Missouri is longer; the Ohio flows stronger. And other rivers, like the Arkansas, join the river further downstream. The Mississippi and its tributaries drain about half the United States! Although we even made it to the Aiton Fire Tower (over half a mile on foot uphill from the nearest car park), and even though other visitors told us that there was a magnificent view of the forest from the top, at 100 feet high, that was too much for my head, and more than enough for my leg. We made it to just the fourth floor. Our itinerary from Nevis to Grand Rapids took us via the small Schoolcraft State Park, named after Henry Rowe Schoolcraft. Here the Mississippi is already 50-100 feet wide. Then the landscape drops noticeably into Grand Rapids where the Mississippi becomes a raging torrent and its power already harnessed by the building of a dam and creation of a lake to power paper mills. Judy Garland – born in Minnesota, not Kansas! Grand Rapids is the birthplace of Frances Ethel Gumm. Frances Ethel who? Judy Garland to you and me, who was born here in 1922, but moved to California four years later. There was a museum a couple of blocks from our hotel. We passed it on our way south. When I looked up information about Judy Garland, it crossed my mind to find out who else famous hails from Minnesota, or spent significant time there. I’d seen a sign to the ‘Charles Lindbergh homestead’ at Little Falls on the drive north where Lindbergh spent much of his childhood. Lindbergh was the first pilot to make a solo flight across the Atlantic in 1927. Minnesota has quite a number of famous sons and daughters, including Hubert Humphrey and Walter Mondale (politicians), F Scott Fitzgerald and Garrison Keillor (writers), the one and only Prince (musician), and James Arness (actor, Gunsmoke), among many others. We like Minnesota. The people are laid back, typical mid-West I’m told. The state has lots to offer, perhaps not as famous as attractions in many other states. Nevertheless, it suits us just fine, as it seems to suit Hannah and her family. This entry was posted in Out and about, Travel and tagged Itasca State Park, Minnesota, Mississippi River.